We returned last week from a three-week vacation in Israel, with a three-day stop in Rome. We used up or gave away all our perishable food before we left and so we expected to come back to a cold and empty kitchen, but our daughter Hannah thoughtfully brought in some provisions for our return. 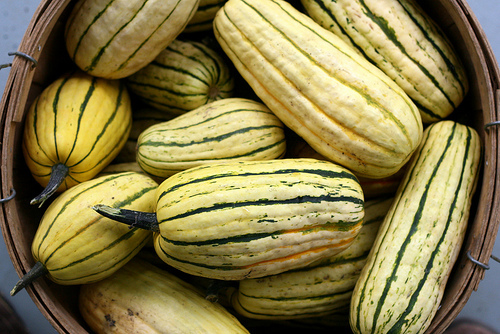 On our counter was a striped delicata squash, which I had seen in stores but never eaten. No need to peel it, Hannah said, just wash it, cut it in half, scoop out the seeds and roast it. So that’s what I did, though I cut each half in slices first. It was delicious — and much easier to prepare than butternut or acorn squash. This is going to become a new favorite in our house. Wash and dry the squash, then cut it in half, and scoop out the seeds. Cut each half into slices about 3/4-inch thick, and put them on a greased baking pan (I used my handy olive-oil Misto to spray the pan). Drizzle with olive oil (or spritz again with the Misto). Sprinkle the slices with kosher salt or sea salt. Roast for about 10 or 15 minutes, than turn the slices over with a spatula and continue roasting for another 10 or 15 minutes. Turn again and continue roasting if necessary. 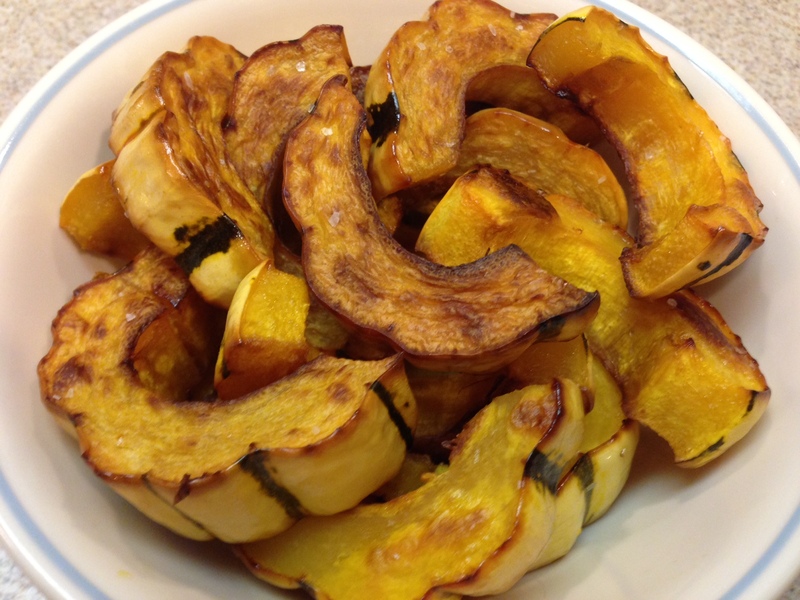 Both sides of the slices should be golden brown and the squash should be soft. If you are cooking something else at a lower temperature at the same time, the squash will roast just as well at a lower temperature — it will just take a little longer, maybe 45 minutes total. I clipped this recipe from the Costco magazine, but that information didn’t appear on the recipe and I couldn’t remember where I got it. When I checked by searching online, it turns out the recipe was developed by Cooks magazine in 2003. It’s kind of a “potchke” so when I make it again, I will use candied pecans from the store (Trader Joe has good ones) and save a lot of effort. The first time I made it our guests included someone who wasn’t eating gluten, so I substituted cornstarch for the flour, and it worked fine. Toast the pecans in a 12-inch nonstick skillet over medium high heat, stirring occasionally, until fragrant, about 3 minutes. Off heat, stir in 1 Tbs. butter, maple syrup and a pinch of salt. Return skillet to medium heat and cook, stirring constantly, until the nuts are dry and glossy, about 45 seconds. Transfer to a plate and set aside. Wipe out the skillet. Add the remaining 2 Tbs. butter to the skillet over medium heat. Add the shallots, orange zest and cayenne, and cook, stirring occasionally, until the shallots are softened, about 2 minutes. Stir in the flour until combined, then add green beans. Add broth, orange juice and sage. Increase heat to medium-high, cover and cook until beans are crisp-tender, about 4 minutes. Uncover and cook, stirring occasionally, until beans are tender and sauce has thickened slightly, about 4 minutes. Off heat, season with salt and pepper to taste. 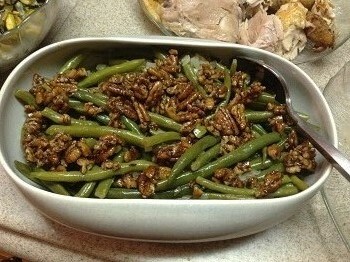 Transfer to serving dish and sprinkle with pecans. I have no idea what The Old Place is or was. It sounds like the name of a restaurant, but if it was in Detroit, it disappeared long before I had a chance to eat there. 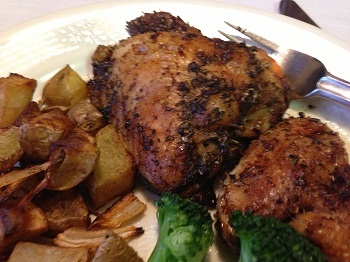 This very easy recipe was published in the Detroit News or the Detroit Free Press. Several hours or the day before cooking, rub the chicken with garlic. Combine the lemon juice and vegetable oil in a dish. Sprinkle the chicken with salt if you use it, pepper, oregano and paprika. Lay the chicken in the oil-lemon mixture, turning to coat each piece. Cover and refrigerate. Alternatively, you can bake the chicken, uncovered, skin side up, in a 300-degree oven for about an hour. You may have noticed a strange post from me a few days ago. That’s because I started another blog and posted an entry to this one by accident. Sorry for any inconvenience. It’s time to pick those tomatoes, zucchini and sprigs of basil from your garden before the first frost. Here’s a nice salad that combines all these ingredients. In a food processor or blender, combine the oil, basil, vinegar, garlic, salt and pepper. Process until smooth. 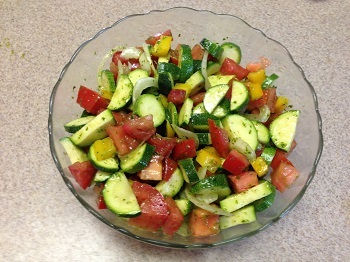 Cut the zucchini in half lengthwise and then into ¼-inch slices. Add the tomato, pepper and onion. Add the vinaigrette and toss well. Leave the salad at room temperature for at least an hour. Garnish with fresh parsley, and serve slightly chilled.